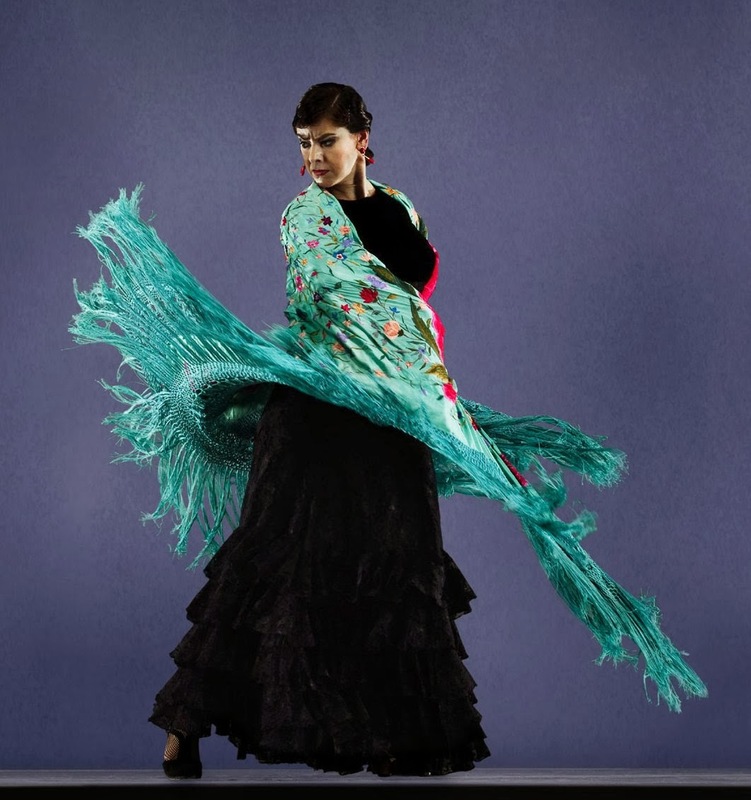 Many people have the idea that shawls are an ancient part of this or that costume. 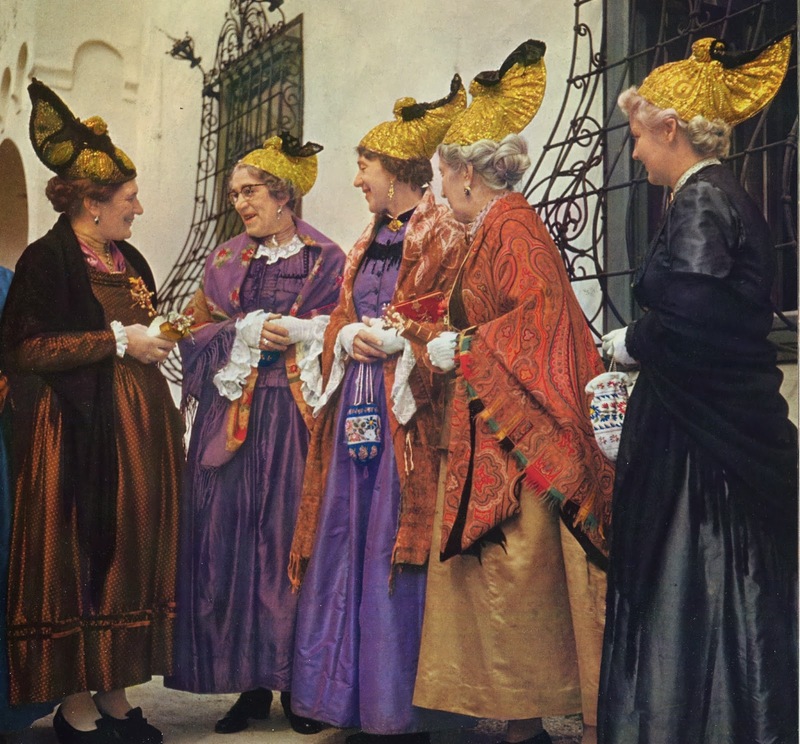 In fact, shawls became part of high fashion in the Victorian Age, and then filtered down into local folk costumes. Capes were very widespread before this, and coats in colder regions, and poor people had been known to wrap themselves in blankets [plaids, serapes, etc], but the large square shoulder shawl is a relatively recent innovation. The image above is of a Kashmir, or 'Paisley' shawl which was developed somewhere around 1860. 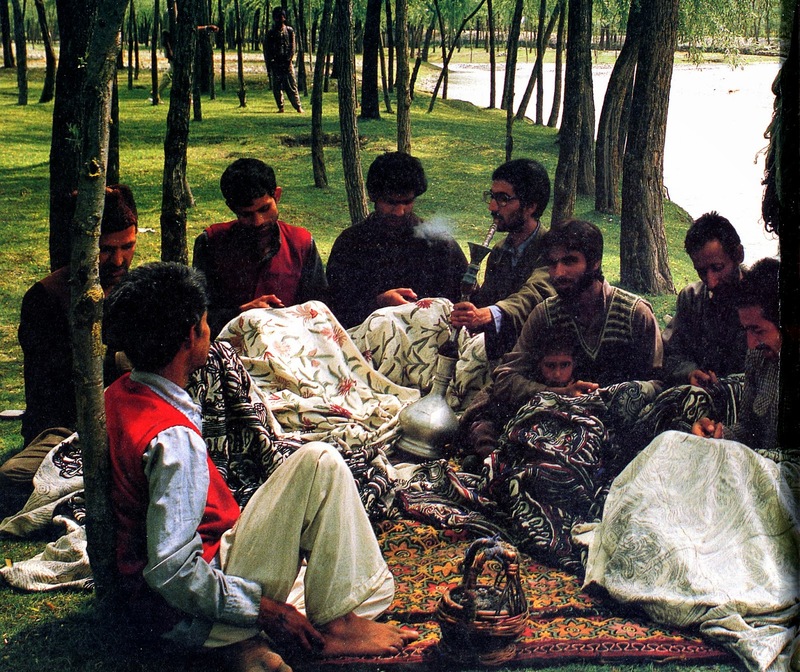 Kashmir has long been known for the fineness of its weaving and embroidery. 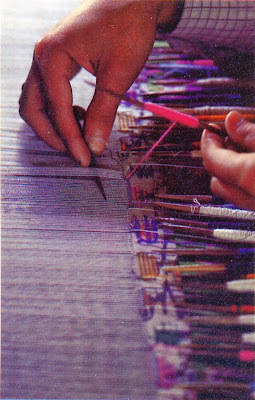 They use a tapestry technique, with wool wound on bobbins called kanis. Today they use 80 to 100 kanis for the width of the loom, in the heyday of Kashmiri weaving they used many more. 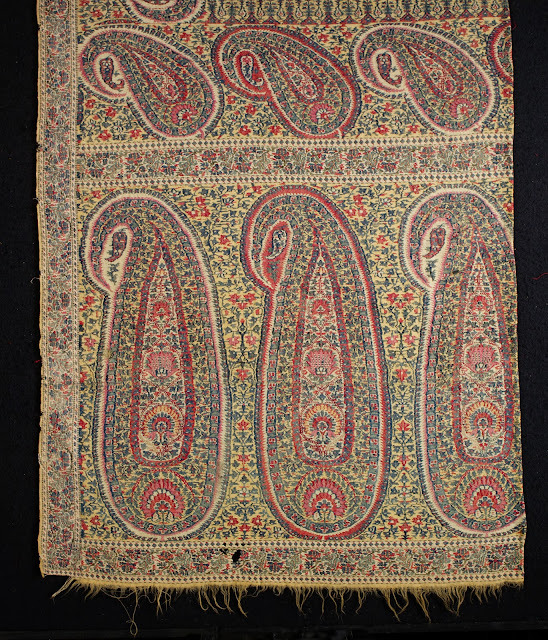 This tecnnique is combined with a twill weave. 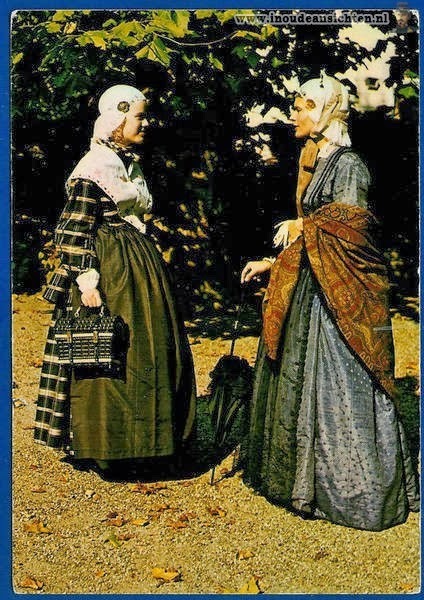 The weaving master sat at a desk with the master pattern, and would call out, 3 blue, 4 violet, etc. 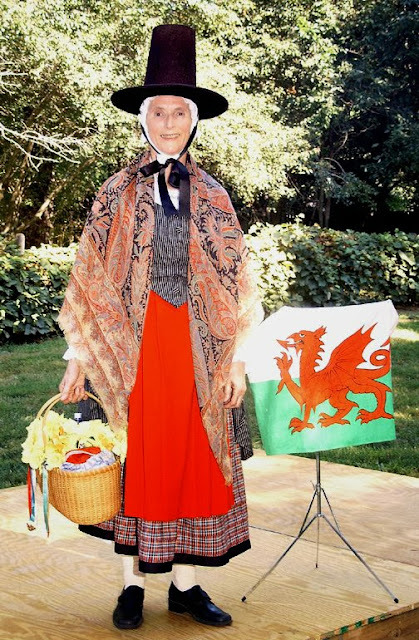 and the weavers would follow the instructions. 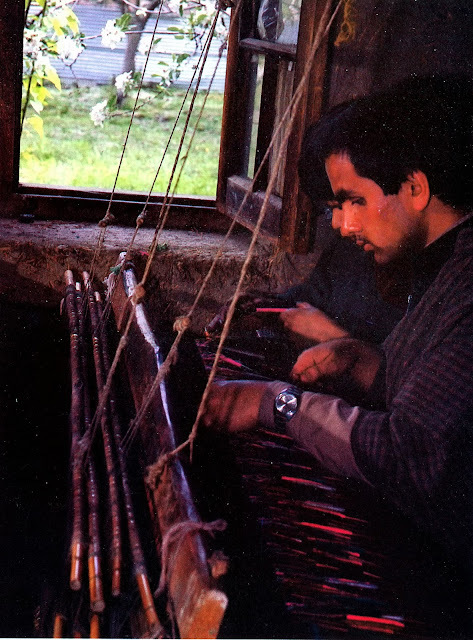 This technique, and the fact that the Kashmiris had access to the world's finest wool from goats raised in Ladakh and Tibet caused their work to be extremely famous in India. 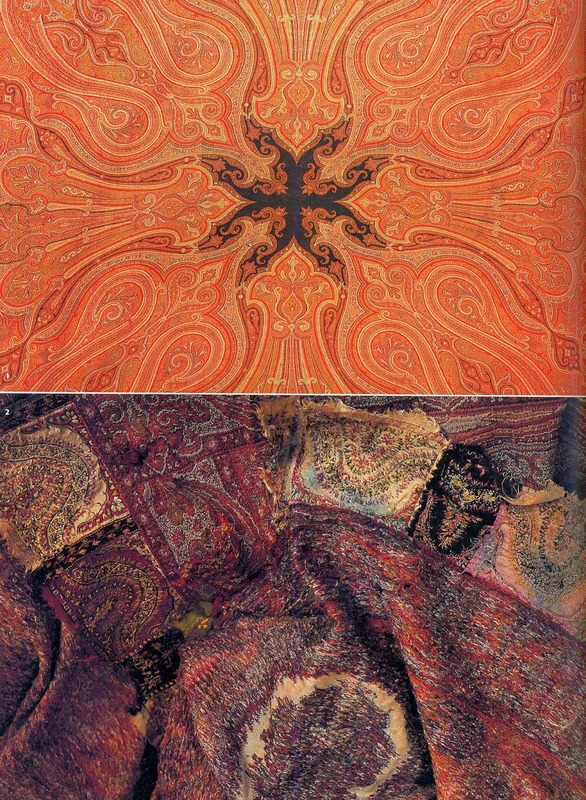 The Mughal rulers did what they could to raise shawl weaving to a fine art. In fact, the word shal is Persian, and is almost the same in every European language, a sign that it is a recent borrowing. 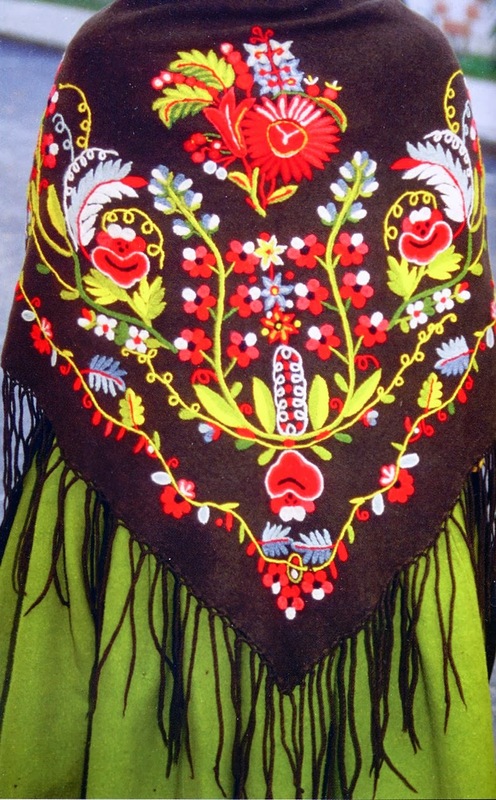 The demand for this product was high, and obviously weaving of this fineness takes a lot of time, so technique developed, where a somewhat coarser design was woven, and then finished with embroidery. Believe it or not, this was actually faster. 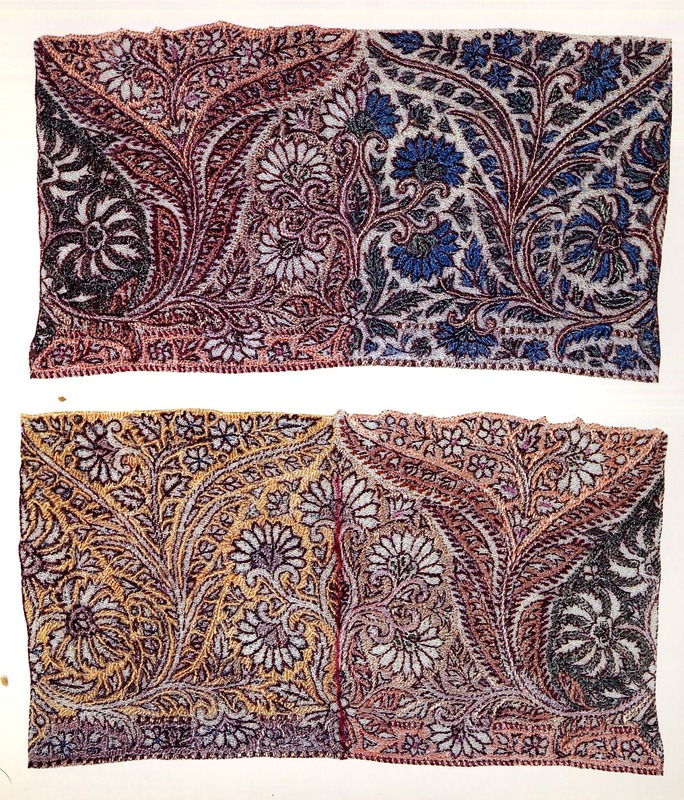 The local embroiderers developed a technique where they could embroider the two sides of a shawl with different colors, by not piercing the fabric with the needle, but splitting the warp thread. 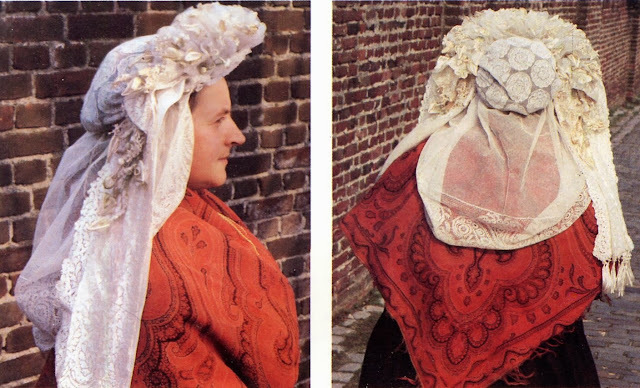 Here is the front and back of one such piece, the outline having been woven in. 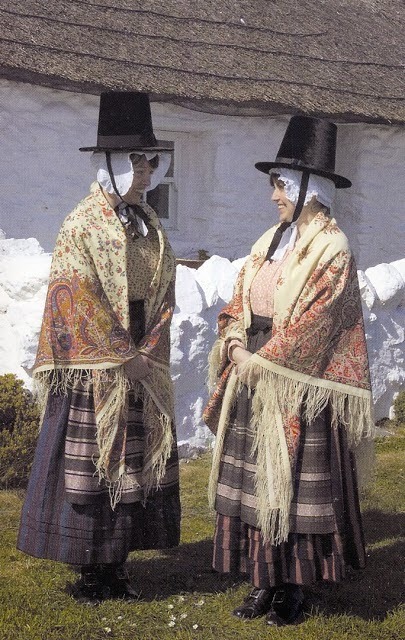 One thing I might mention is that the weavers and embroiderers of these products, which were never used locally, but always exported, are men. Women spin the thread, and produce textiles for home use. Here is a contemporary photo of a group of men doing crewel embroidery on rugs and upholstery material. The basic motif of these shawls is called boteh, or in English, cone, pine, mango, flower, paisley, etc. 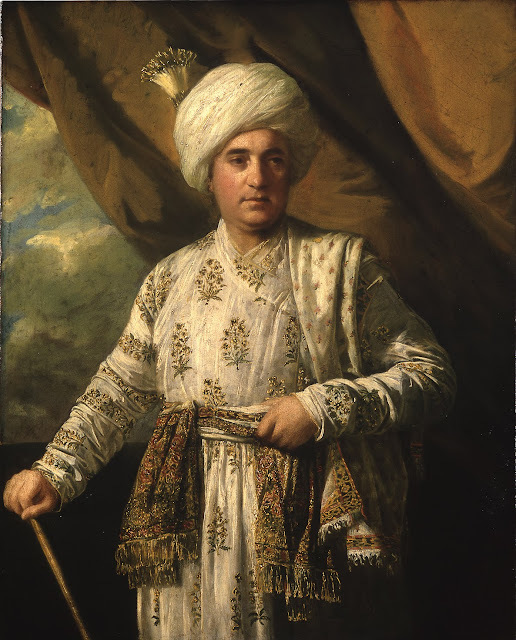 They were greatly valued in India, where they were worn by the aristocracy. These shawls became known among British women of means starting around 1774. 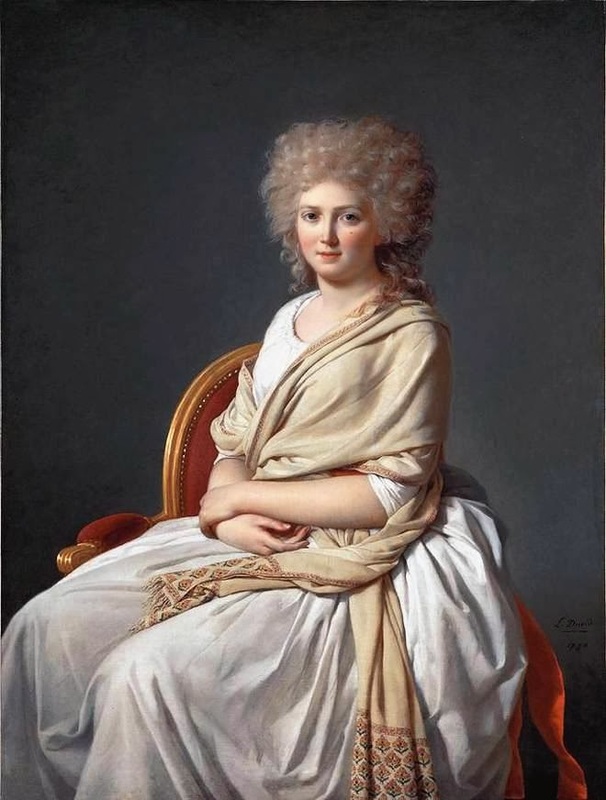 In 1810, Napoleon gave his empress Marie Louise several. 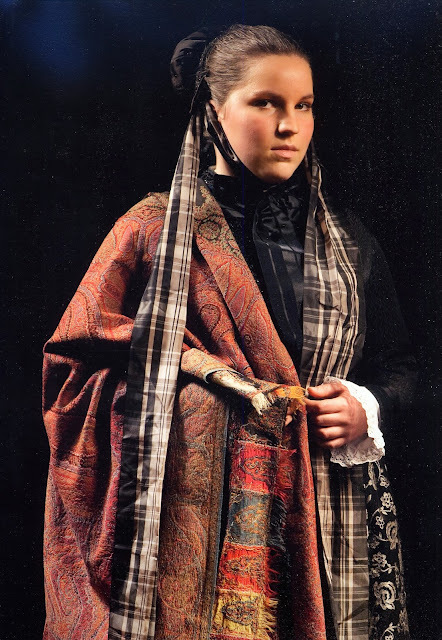 Soon "Madame, who had abandoned her cloak, wished not to be described as 'well-dressed'; she must now be 'well-draped'. 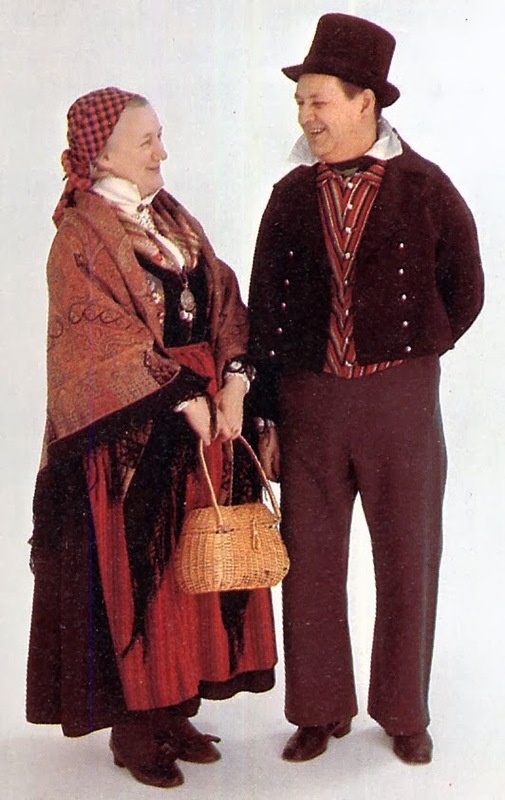 Shawls became all the rage. 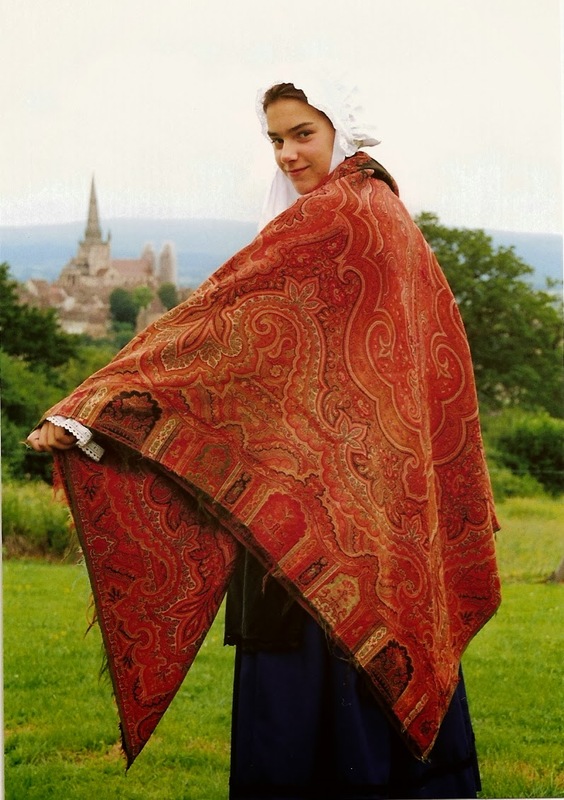 Obviously this meant that demand far exceeded supply of the old high quality shawls. Soon improvements were invented for European looms and imitations started to be woven in Paisley, Scotland, Lyon, France, and later other locations. 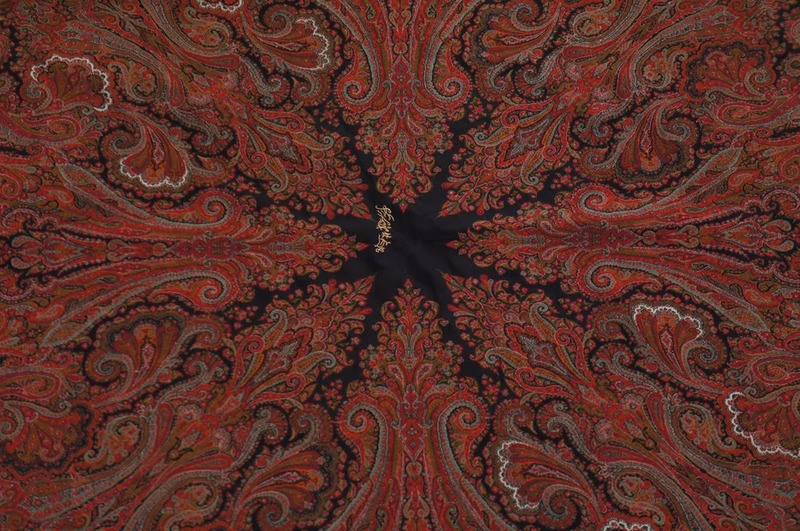 This is what lead this type of design to be called 'paisley' in English. 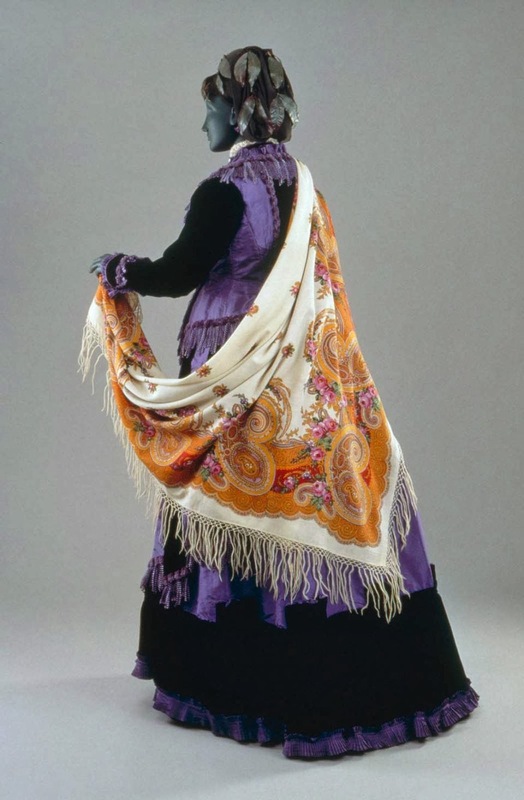 Originally these shawls were long and rectangular, but at some point in the mid 1800's, they began to be made in large squares, and this became the standard. This required an advance in the jacquard loom, and meant that shawls imported from Kashmir had to be made in smaller pieces and then sewn together. The stitching on some of those shawls is extremely fine, and almost unbelievable. As these cheaper imitation shawls became available, they began to trickle down into various folk costume traditions. They all look quite a bit alike. 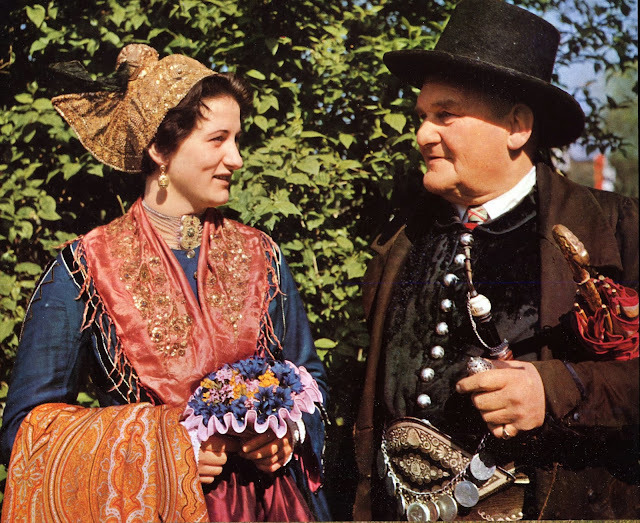 These are still being worn as part of various local folk costumes, although Fashion at large has now bypassed the shawl. 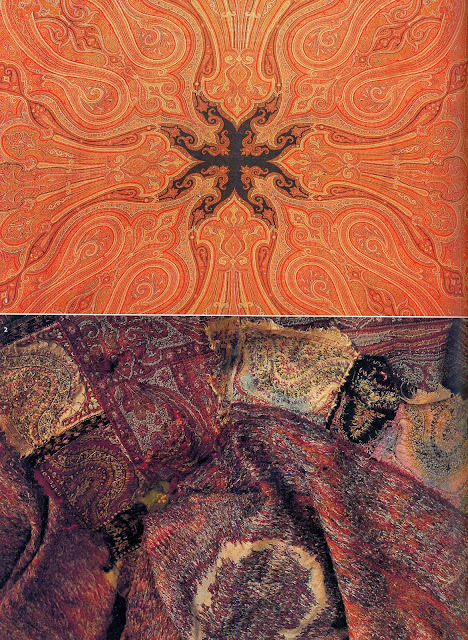 Here are some examples of shawls which I have found in various of my books from different nations, I am sure that there are more. 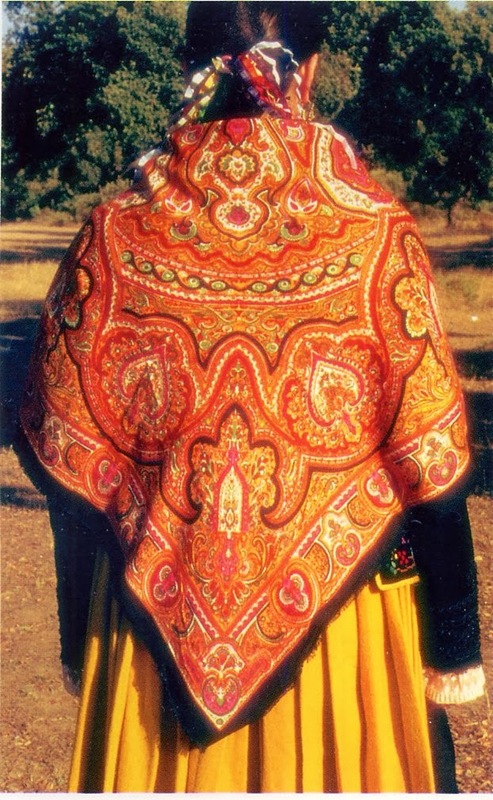 This type of shawl had a far smaller area of expansion, being limited to the Mediterranean area, but had a similar history. China at some point became aware of the fashion in shawls and decided to enter the competition. 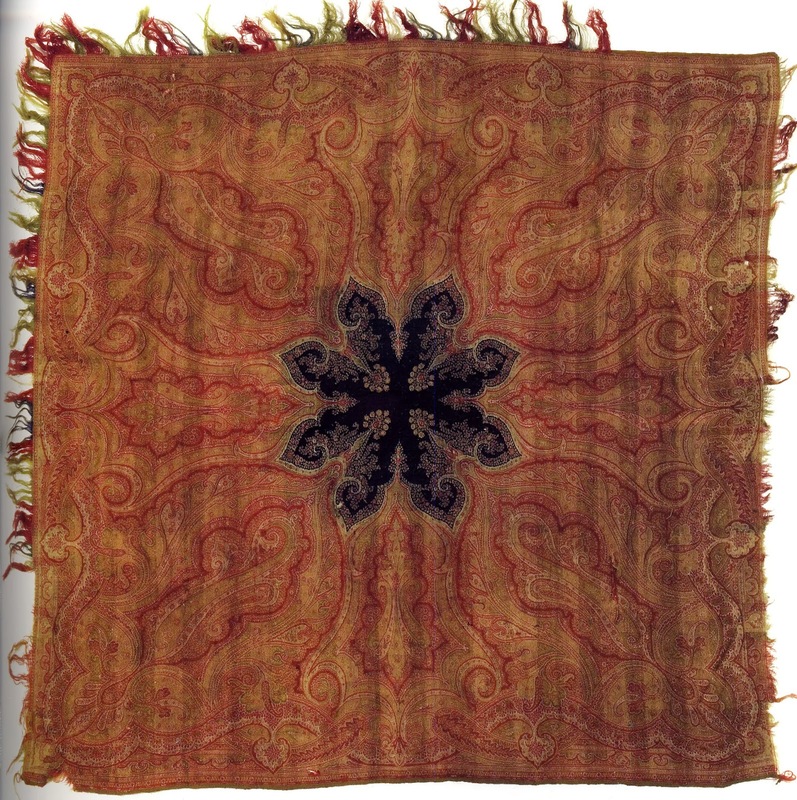 Large square shawls with fringes were embroidered and sent into the foreign marketplace. 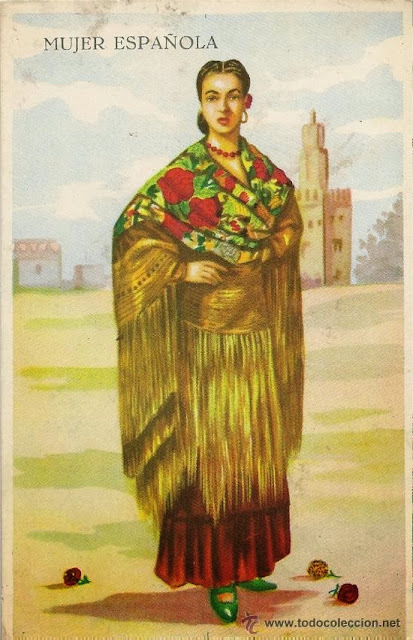 These were often transshipped through Manila in the Philippines, and became known as 'Manila' shawls, although they were never produced in Manila. 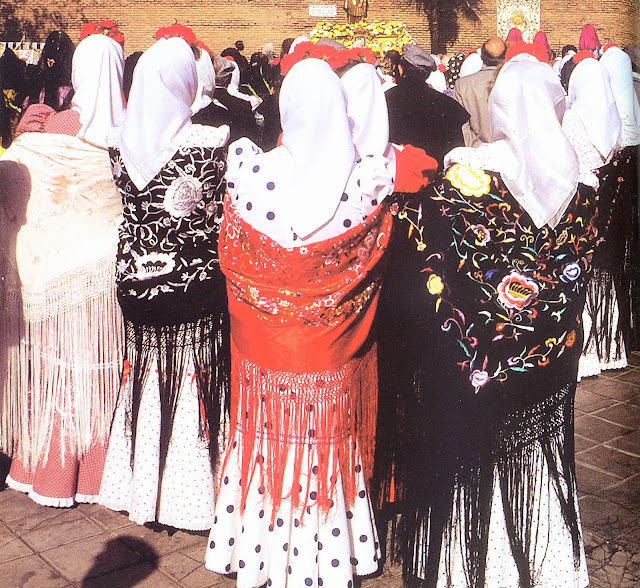 These shawls became especially popular in Spain. 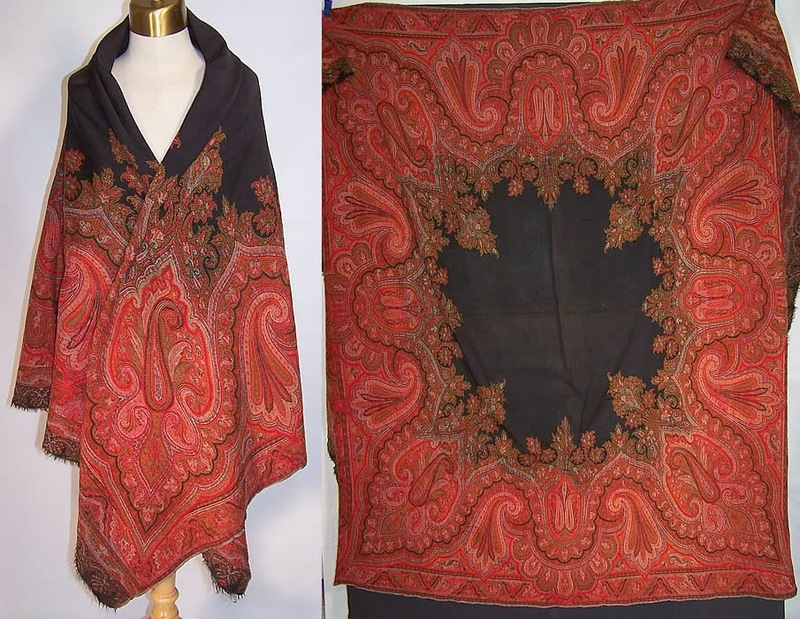 The embroidery on these shawls is very typically Chinese. 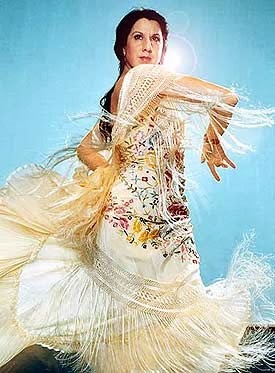 They came to be imitated locally, of course, but still the Chinese style of embroidery was copied. 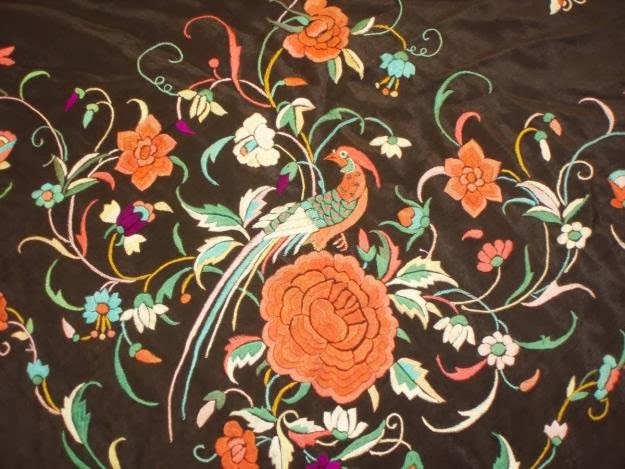 They mostly feature floral designs, with the addition of butterflies, dragonflies, and birds which are not found in Europe. 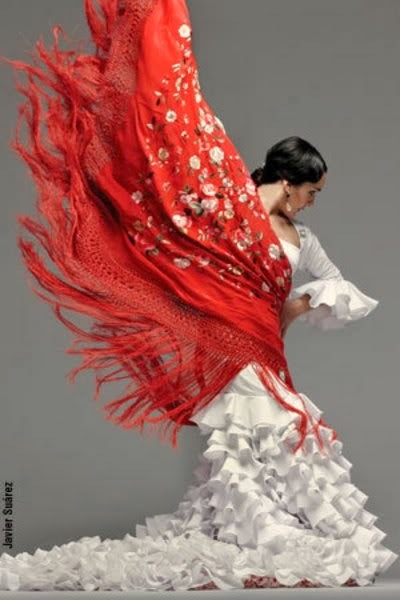 These became incorporated into Flamenco. 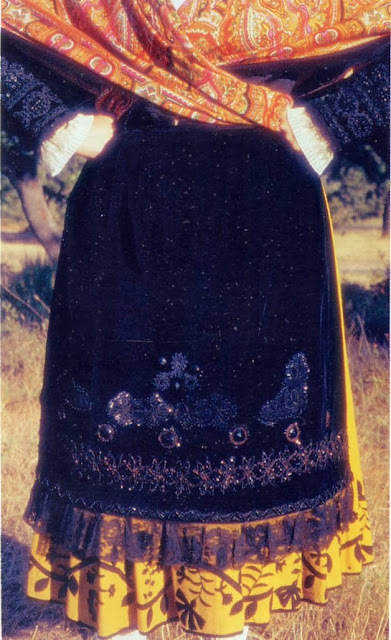 Sometimes they were worn with the center point in front. 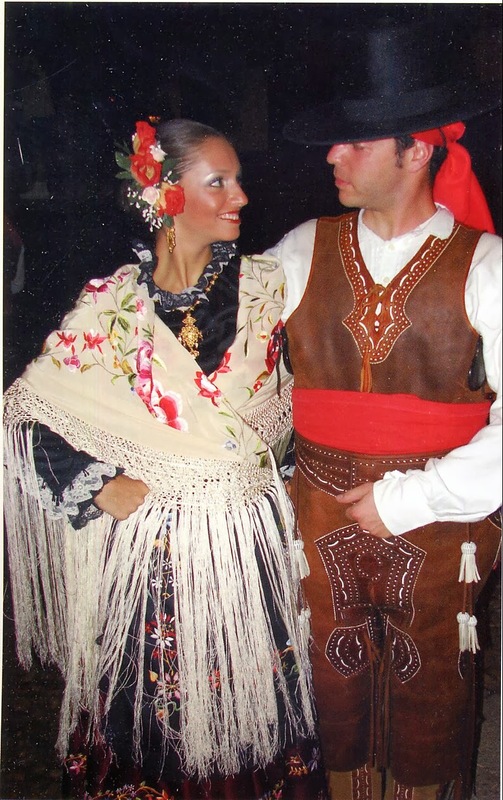 They are still worn as part of the gala version of the folk costume in some places, especially in the south. 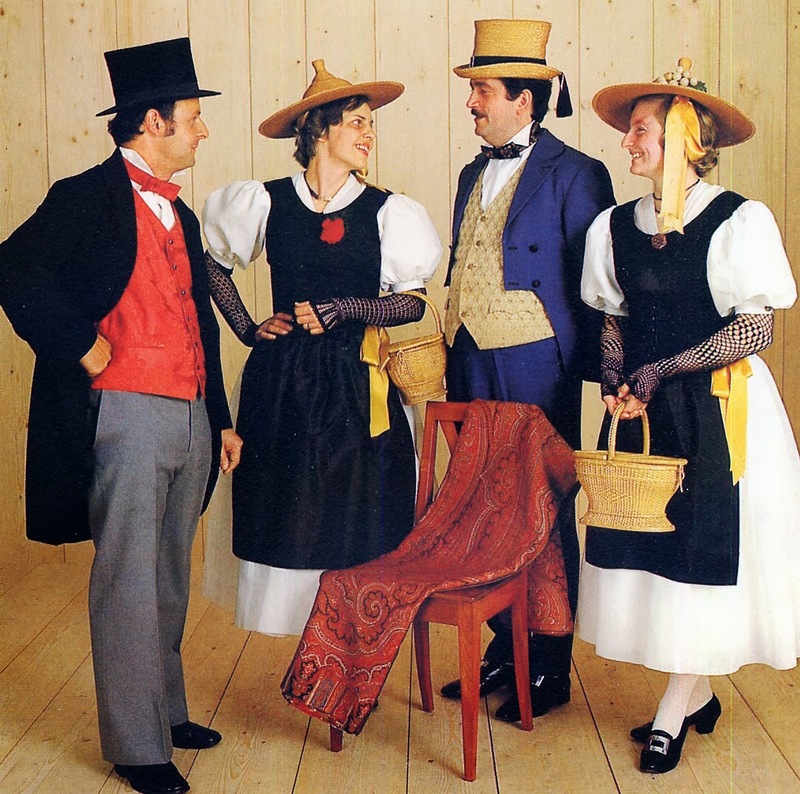 They are also worn with modern clothing. Here are just a couple of examples. 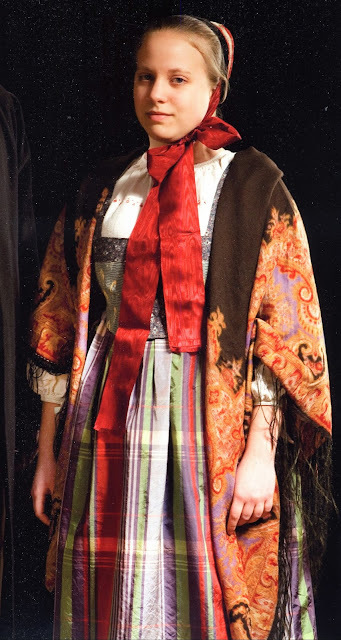 I admit to finding images like this annoying, because while the shawl is beautiful, it is an import and covers up most of the rest of the costume, making it harder to do research. On the other hand, some areas which were too poor to be able to buy these shawls have come up with extremely imaginative local versions which only slightly resemble manila shawls, such as this example, de Plumaje. 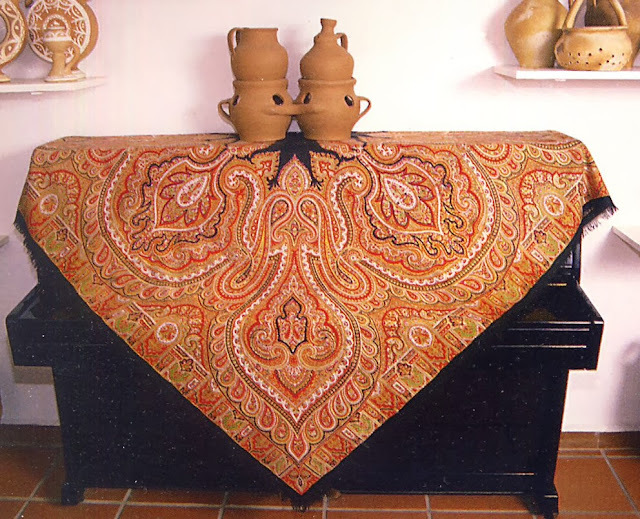 This is no longer a manila shawl, but an authentic local expression of folk art. 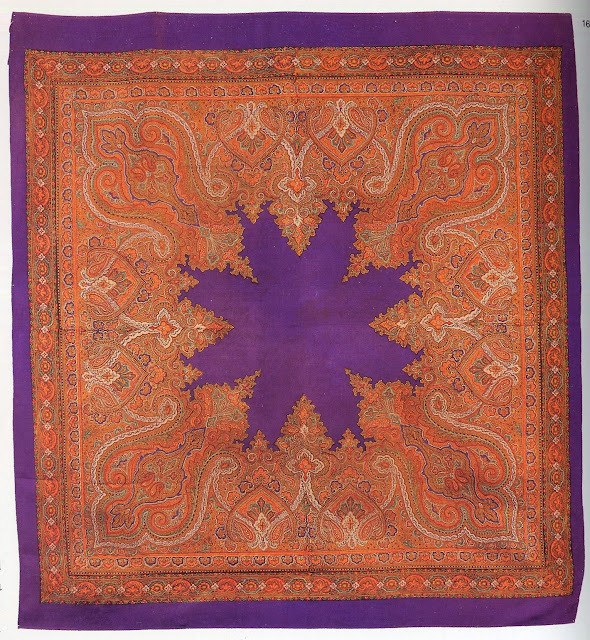 'Manila' shawls also came to be used in the Middle East, where they are sometimes referred to as 'Ramallah' shawls. 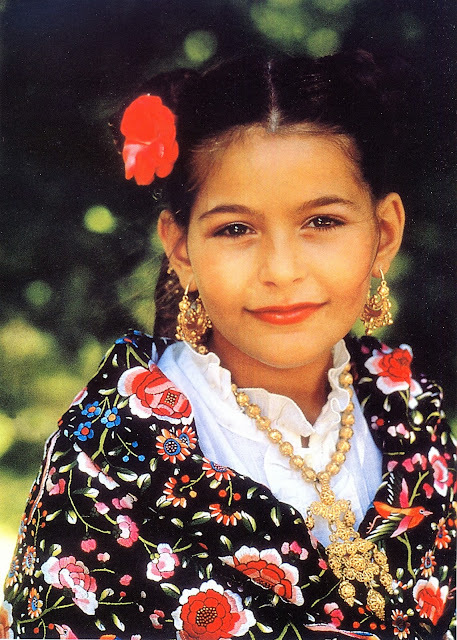 I guess this is proof that beauty is universally appreciated, and globalization is nothing new. The source material is too numerous to list. If anyone wishes to know the provenance of a particular image, please ask.